The Samsung Galaxy S5 features a 16MP camera and is the first phone to use an ISOCELL sensor. It's a large sensor too, 1/2.6". For comparison, the Lumia 1520 / 929 Icon sensor is 1/2.5" and the Sony Xperia Z2 sensor is 1/2.3". Better still, it's a 16:9 sensor so widescreen photos use the full sensor, while the Galaxy S4 camera loses nearly 4MP to cropping. Phase Detection Auto Focus promises very fast focus locks and from our testing it delivers - the Galaxy S5 is both faster and more accurate than the HTC One and iPhone 5s. The interface has been mildly redesigned and is closer to the classic camera UIs. There's a column of shortcuts on the left, the middle two of which are customizable. All settings are collected into a grid of shortcuts so you can access everything easier. The Mode button has been simplified too, it's now just a scrollable list at the bottom. Several options have been combined into Shot & more - Best photo, Best face, Drama shot, Eraser and Panning shot. A new mode is Virtual tour shot, which is similar to panoramas except you can move forward, turn left or right, move some more. The result is an animation of your camera movement, the phone will even draw a map with your path. More modes can be downloaded too. Selective focus is another cool new mode. It takes two shots and processes them so you can photograph a close-up subject and blur the background or blur the object and keep the background in focus. The third option is everything in focus, here's how those options look. The processing isn't perfect, but the upside is that this mode is very quick. A quick note on Virtual tour and Selective focus shots - they produce a single JPG file that's easy to share. When viewed, it appears as a single photo, but you'll need a compatible Galaxy device to view the additional functions (refocus or play the virtual tour). As a result file sizes are pretty big too. We wish Samsung enabled an option to export virtual tours to videos so they'll be much easier to share. We set up an impromptu shootout between the Samsung Galaxy S5 and several other phones we had laying around in our office. 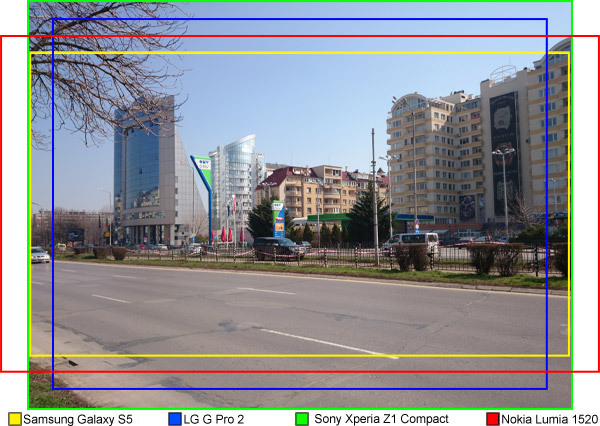 For still image quality, we're pitting it against the LG G Pro 2, Nokia Lumia 1520 and the Sony Xperia Z1 Compact. We've prepared 100% crops and after those you'll find the full resolution images. The first crop looks at the textured exterior of a building. The Samsung Galaxy S5 captures the most out of the texture although it also over-sharpens the most. 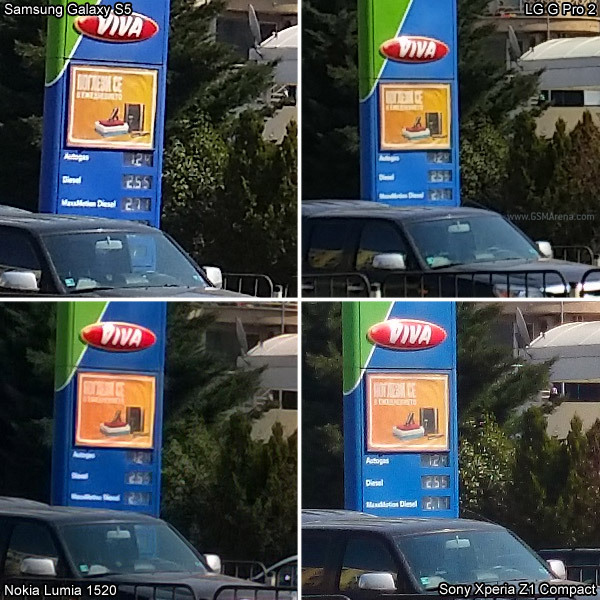 The Nokia Lumia 1520 clocks in second with good detail and the least visible signs of processing. The LG G Pro 2 does fairly well too. The Sony Xperia Z1 Compact photo features a good deal of noise, which shouldn't be mistaken for detail. All phones are off when it comes to white balance, each in its own way. The second crop focuses on a distant detail and the Galaxy S5 comes out on top again - the writing and the foliage appears the sharpest, but colors are oversaturated and oversharpening is noticeable again. Here the LG G Pro 2 snatches a point from the Nokia with marginally more detail. The Sony Xperia camera once again shows a lot of noise, but did better with the detail this time, matching the Galaxy S5 in that aspect. 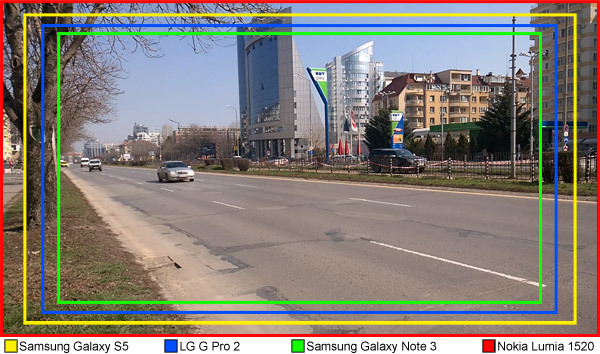 We also wanted to find out how the switch to 16:9 aspect ratio has affected the Field of View (FoV) on the Galaxy S5 camera. It's as wide as Xperia Z1 Compact, though that one has a vertical advantage. Unless you're using a 16:9 mode, such as Superior auto, then both are equal. We also tested how the phones perform in low light. 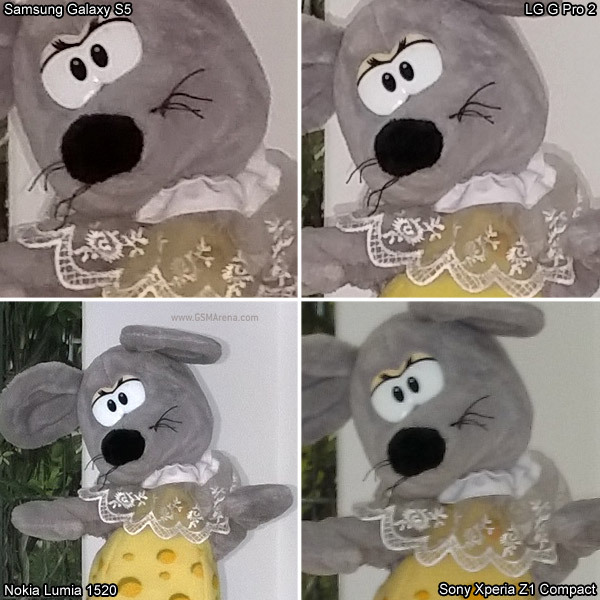 The ISOCELL tech is supposed to reduce the noise in the dark, let's see how it stacks up against the super-sampling of the Lumia 1520 and the Superior auto mode of the Xperia Z1 Compact. The first batch of photos were taken with the flash off. Here the bigger sensor of the Nokia has an advantage after the super-sampling does its work, which helps reduce the noise from the high ISO (640). The optical image stabilization helped keep the shutter open longer too (1/24s). The Samsung Galaxy S5 did fairly well here too with a faster shutter speed (1/33s) and lower ISO (320). The lack of OIS limits exposure time. That didn't help the LG G Pro 2, which was optimistic with the shutter speed (1/16s) and ISO (200). That said, the Sony Xperia Z1 Compact redeems its poor performance earlier despite the even more aggressive settings (1/16s, ISO 64). We enabled the flash and took a new series of photos. The flash allowed the Galaxy S5 to halve the ISO setting at the same shutter speed, which did bring in more detail. The more powerful flashes of the Lumia 1520 and LG G Pro 2 result in a more noticeable improvement with the Nokia coming out on top. The weak flash of the Sony Xperia Z1 Compact didn't do much for it. Here are some Galaxy S5 photos collected in one place for convenience. The Samsung Galaxy S5 has HDR mode too. The ISOCELL technology promises to increase dynamic range, but the dedicated mode pushes things further. 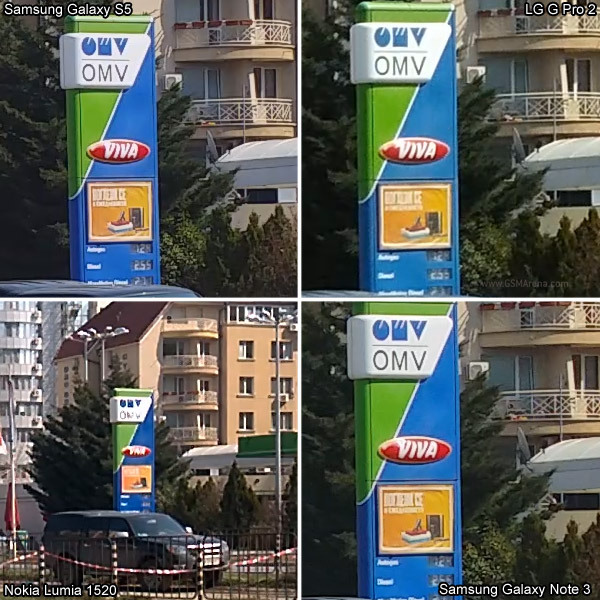 Samsung has consistently been among the HDR mode top achievers and the Galaxy S5 is no exception. It adds detail to both highlights and shadows and does a great job of hiding artifacts like ghosting. The effect is a bit too strong for our tastes (HDR always reduces contrast), but it works great overall. Galaxy devices also take some very high resolution panoramas. The Samsung Galaxy S5 does 60MP photos and the level of detail is pretty amazing. The stitching is very accurate too. To summarize, the Samsung Galaxy S5 camera is an excellent all-rounder. Photos taken in daylight have a commendable level of detail and, while processing comes on a bit strong, it shouldn't be visible unless you're viewing photos at 100%. For low-light shots, the Galaxy S5 finds a good middle-ground - it's not as good as the Nokia Lumia 1520, but produces perfectly usable shots. Finally, the additional modes do great with quality HDR and high-resolution panorama. 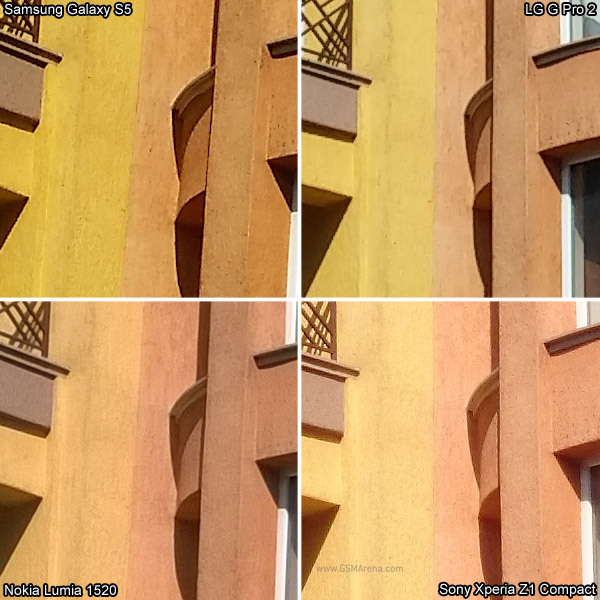 The Samsung Galaxy S5 camera produces great photos for the 16MP league - follow the links to our tool to compare the device to the other smartphones we've tested. The Samsung Galaxy S5 can record 2160p videos at 30fps (in this mode some features are disabled), 1080p at 30fps and 60fps. There's also a 120fps slow-motion mode at 720p. Videos are stored in MP4 files with bitrate varying by mode. 1080p @ 30fps videos are still captured 17Mpbs, 60fps mode goes up to 28Mbps, while 2160p videos are at a whopping 48Mbps. That means a short 30 second video grows to 180MB - be mindful of that if you're recording a video you want to share later. In any case, sound is recorded in stereo at a bitrate of 128Kbps and a sampling rate of 48kHz. The video camera doesn't have as many fancy shooting modes as the still camera, but dual shot is available and you can do time lapse videos. The time lapse videos can speed things up to 8x, with resolution and frame rate remaining at 1080p @ 30fps (time lapse actually requires less processing power than regular video capture). Touch focus is available before and during video recording and you can switch back to continuous autofocus if you prefer. There's also digital zoom available up to 4x and the quality is pretty good even at the highest level. Videos shot with the Samsung Galaxy S5 offer stunning detail, especially if you shoot them at 2160p. Noise levels are low, color accuracy is good and there are few traces of aggressive post processing (unlike with the still camera). The same goes for the 1080p video mode too - obviously you don't get as much detail, but the much smaller file size and better compatibility (many computers can't play 2160p properly, especially when it's in a Flash container) make us think this mode will be used the most. We swapped the Xperia Z1 Compact with a Galaxy Note 3 and made crops from 2160p videos, except for the Lumia 1520, which shoots 1080p only. Here the Galaxy S5 comes clean ahead of the second in line, the Galaxy Note 3.The levels of detail are comparable, with a slight advantage for the S5 but in reality the difference is bigger as the Galaxy S5 has a much wider field of view (FoV). The FoV of the LG G Pro 2 is a bit wider than that of the Note 3, but the image appears softer. The Samsung Galaxy S5 is one of the few 2160p-enabled cameraphones in our database, but they are becoming more common with recent releases. The resolution chart (third one) shows an image quality that will give 8MP still cameras a run for their money. Image quality in good light is stunning, though compression artifacts start to creep in the shadows. In low light, most of the fine detail is gone, we'd go with 1080p in the dark.